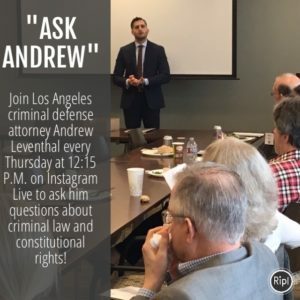 Many know that I am extremely passionate about criminal law and individual rights: I am launching a new Instagram Live series entitled, “ASK ANDREW” every Thursday at 12:15 P.M. Join me live and ask questions about criminal law and constitutional rights. I love to share my experience and knowledge over the years in criminal law to educate the world about what the system really is. In addition, I feel that it is very important for people to know their rights. See you Thursdays!